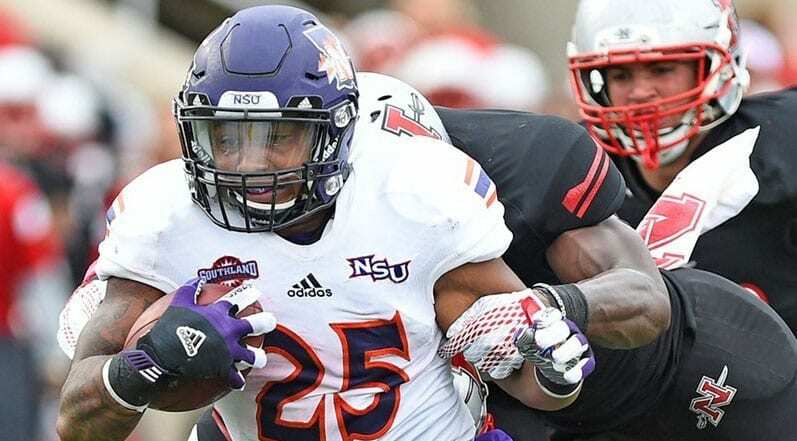 THIBODAUX — After tying Northwestern State’s school record, last accomplished by the legendary Joe Delaney in 1978, with four rushing touchdowns Saturday afternoon at Nicholls State, all De’Mard Llorens wanted to talk about was the Northwestern State offensive line. Demons’ head coach Jay Thomas concurred, and added praise for the Demons’ much-maligned defense for the fourth-quarter stops it delivered to preserve a rain-saturated 37-21 Southland Conference triumph at Guidry Stadium. Llorens, a junior from Natchitoches Central, scored on runs of 1, 24, 13 and 2 yards while posting the most rushing yards (166 on 23 carries) by a Demon since Byron Lawrence had 173 in a 2008 overtime win at Texas State in his senior year. Llorens paced an NSU running game which averaged 7.8 yards per carry while piling up 358 on the ground. “We’ve got to give credit to the big guys on the O-line. We all had room to run because of the work they did,” said Llorens, who scored all three first-half touchdowns on the way to joining Delaney (1978 against Nicholls in his record-shattering 299-yard game), All-American Sidney Thornton (1976 vs. Stephen F. Austin) and Mario Cage (1974 vs. Southeastern Louisiana) in the NSU record book. “Those big boys, they’ve come to play in our last three games. They have put the hammer down,” said Thomas, who won for the first time as a visiting coach at Guidry Stadium, where he coached for 14 seasons, including six (2004-09) as head coach. “And we have backs who can definitely make the most of open space, and also, they run hard. All he did could have been in vain, if not for fourth-quarter toughness from the Demons’ defense. Preserving the 16-point advantage, NSU (2-6 overall, 2-4 in the Southland) gave up only 70 yards in the final period, forced two punts and clinched the outcome with a Chase Collins interception inside the 20 with 1:38 to go. Senior linebacker Jacob Merriman set the pace with eight tackles, including one of six for lost yardage by the Demons, and recovered a fumble. The four turnovers gained did not include a fumbled third-quarter Colonels snap that was knocked out of the end zone by defensive end JeMarcus Marshall (who also recovered two fumbles) for a safety in an opening seven-minute, second-half onslaught as Northwestern State posted 16 unanswered points to take control, 37-14. With his team nursing a wobbly 21-14 halftime edge after an 11-play, 74-yard drive by Nicholls (1-7, 1-5) drew the Colonels within seven 1:49 before the half, Thomas encouraged the Demons as they left the dressing room for the third quarter. “I told every guy ‘finish’ hoping we would keep the upper hand. Nicholls ended the first half with the momentum and they were only seven down, and the weather was coming, so it was a little dicey,” he said. Evidently the Demons translated “finish” into “erupt.” With Joel Blumenthal quarterbacking the first series of the half, NSU covered 67 yards in seven snaps, including a 26-yard Llorens burst, and cashed in on his record-tying 2-yard TD 3:27 into the third quarter. Just over a minute later came the safety, and only 2:02 elapsed before Stephen Rivers flipped a swing pass to Daniel Taylor in the left flat. The senior running back, a half-hour ride from his Lutcher hometown, won the race to the corner, then danced outside the edge of the Colonels’ sideline down inside the 10 and cut back across the grain to complete a sensational 38-yard score and create a 23-point advantage with 8:12 to go in the period. Winning despite Rivers and Blumenthal tossing only eight passes, the Demons extended a surge that began during the open date week after a discouraging Oct. 3 loss at Incarnate Word when the Cardinals overcame a 14-point deficit. “There’s no doubt, we’ve played our best since then. Last week we gave a great effort and played our best game at McNeese, an unbeaten team, and had a chance to win in the fourth quarter. We got back on the road this weekend and won in a stadium, on Halloween by the way, where the Demons have had a lot of trouble through the years. A lot of teams have, though. It’s a tough place to play,” said Thomas. The Demons play two of their last three at their Turpin Stadium, beginning next Saturday at 6 p.m. against Abilene Christian, a 15-13 homefield loser Saturday to McNeese.